The most important time of the year for the retail industry, Black Friday and now Thanksgiving Thursday, is two weeks away. New data from JLL’s 2014 Holiday Sentiment Report found that nearly 1/3 of respondents’ stores will be open on Thanksgiving Day, and that 90% of retailers expect Black Friday to generate upwards of 40% of their total annual sales. It’s likely shoppers will see even earlier openings on Thanksgiving, and bigger door buster deals on Black Friday as retailers seek to accommodate eager spenders. As JLL’s team of 800 property management, leasing and investment sales experts across the nation also prep for the busy season, Karen Raquet, leader of JLL’s National Retail Property Services, remembers the Black Friday of 1987. Check back during the coming weeks for more updates on Black Friday and Thanksgiving Thursday from JLL’s 2014 Holiday Sentiment Report, which includes feedback from 800 largely national or global retailers in JLL-managed shopping centers across the United States. 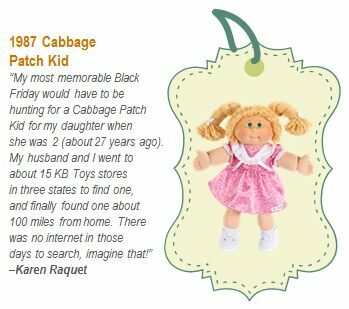 Categories: Americas Retail and tagged Black Friday, Cabbage Patch Kid, JLL, Karen Raquet, retail.